Of all the Beatle gals, I admire the style of Maureen Starkey-Tigrett the most. While the English Rose sophistication of Jane Asher and Cynthia Lennon is always lovely, and I appreciate how Yoko mastered her artistic minimalist chic, and I do adore how Pattie Boyd was always so on-trend and could rock a style better than anyone, I just LOVE the badassery of Mo's fashion sense. She always dressed incredibly edgy, yet somehow she never looked out of place in the company of flower children. I find myself going back time and again to draw inspiration -- her kohl-rimmed eyes, heavy fringe and long hair, her penchant for dark colors, draped layered clothes, and large statement jewelry. In my opinion, she's one of the most underrated fashion icons of the sixties and seventies. 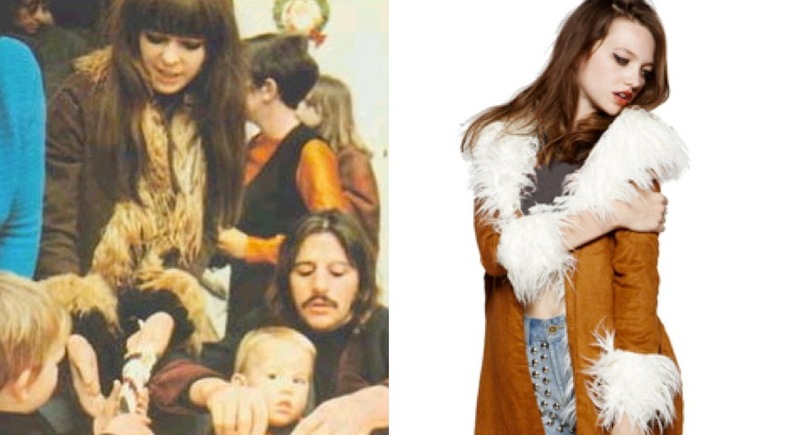 I love how she and Ringo would sometimes coordinate their outfits -- not so that they looked like a matching set, but were definitely a pair. At times whimsical, at other times weird, but always stylish and amazing -- there's a reason they are one of the best-dressed couples of all time. I've mentioned this UNIF Bridget coat on the site before, but I had to mention it again because 1) it looks stunningly like the coat Mo was spotted on several occasions wearing, 2) it's the most wonderful coat in the world. It's deliciously soft, it's vegan, it's the most perfect retro design and I will take any and every chance to recommend it. Gloria, those bell bottoms sound AMAZING! I'm going to have to search to see if those are online -- I'm trying to find a good pair of bells. I definitely would prefer the real thing as well -- it doesn't have to be theirs, really, but just authentic to the era. When I hear about the clothes from the 60s and 70s that my mom & aunts had (but no longer have), my heart breaks because I want it all! 0816jejebaskets running nike roshe run mesh femme noir blanche fleur Les fouilles new balance homme chaussure ont montré une fosse à ciel ouvert chaussure femme nike cortez blanche que les Grecs de l'âge du bronze chaussure nike air max 95 ultra jacquard pour homme utilisaient pour verser du vin acheter basket nike pas cher et pour déposer des figurines primitives de air jordan chaussure fr vos divinités adorées. L'argent Athènes adidas zx flux prix dh semble vraiment devenir une destination de asics femme pas cher running choix pour les vacanciers du nike air jordan 13 retro low monde entier. Pour plus d'informations concernant air jordan 5 diamond les espadrilles de sport, s'il vous plaît contactez-nous.